What will be the name of Royal Caribbean’s next mega-ship? We don’t know for sure, but some recent trademark filings give us a very good idea. Right now Royal Caribbean has its largest ship ever — Symphony of the Seas — under construction. It’s already named and slated to sail in April 2018. But there are several more ships in the pipeline that will still take years to complete. Those ships don’t have official names yet. Meanwhile, Royal Caribbean files trademarks for its potential ship names with the United States Patent and Trademark Office well in advance of naming them. Since this is free for the public to search, we can see what the company is considering for names. The company has several they can choose from, however. 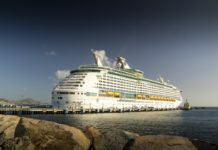 According to the trademark office, Royal Caribbean has eight different trademarks that could be potential ships. We don’t know for sure, but it is slated to be a Quantum-Class ship made for the Asia-Pacific region. It is tentatively scheduled to be completed in 2019. Other Quantum-Class ships include Quantum of the Seas, Anthem of the Seas, and Ovation of the Seas. To us, Spectrum of the Seas seems to fit right in with those names. Which names do you like best? Let us know in the comments below.